The MasterHelper is an innovative mast rising system for the Flying Scot that makes it possible for anyone to step a Flying Scot mast. Click on the images below for more details. For more information send email to fs2929@optonline.net . Thanks for making the Master Helper for my wife to give to me last month. I got it out today and it worked great! 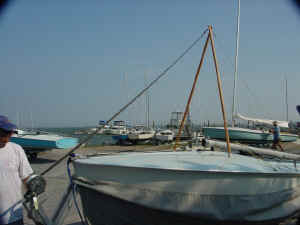 I raised and lowered the mast alone today without a hitch, thanks to your great invention! I've stepped and unstepped Lighning masts (30 years) and Scot masts (15 years) without significant problems, but in the past few years have been increasingly uncomfortable about finding someone to help steady the mast. I worry about tripping on a line or having to deal with an unexpected gust of wind. Now I won't worry no more! Many thanks; your instructions are flawless. 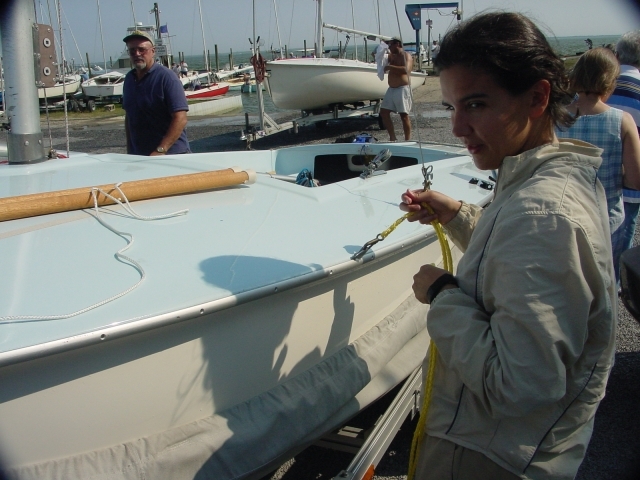 Today I put on the trailer strap and raised the trailer tongue onto a step-ladder, so with lowering the mast dropped back without any coaxing. So, I’m just a simple right-brained creative guy, and managing a tiller, a main and a jib without hurting myself is a real accomplishment. So I was completely amazed at how well the MasterHelper does its job. It’s beautifully conceived, nicely built and easy to use. I was initially intimidated by the instructions, but they, too, are very straightforward and well done. What a great product! It takes a stressful, potentially risky task and makes it as simple and pleasurable as sailing a Scot. I purchased the MasterHelper from FS and want to tell you it is a godsend. It took a stressful worry to an effortless occurrence. I bought a MasterHelper this spring, and we love it! The kids can raise & lower the mast, and mother no longer worries about this old man being injured in the process. It is one of the best purchases we have made for the boat. I have had a FS (3779) for 17 years and always looked for my biggest and strongest neighbors to help with the mast stepping. My 5'2" wife began hiding after the first year. The MasterHelper was intimidating out of the box but the photos on your web sight made the whole process crystal clear. The mast went right up and the only glitch was I had to move the base of the mast 1 inch over to sit properly on the deck footing. Once I got the proper placement of the lines which will now be simple the mast was stepped in minutes. Thank you for your clever invention and kudos for supplying the photos on the web. Maybe adding the photos to the kit package would be a good idea for those that don't have a handy computer near by. Thanks again and Happy sailing. The Side to side bridle supports the mast when the side stays become loose. With the mast up the A-frame lays down on the deck. 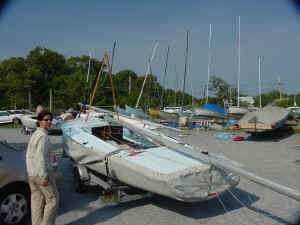 It attaches to the forestay and the hook on the trailer winch. 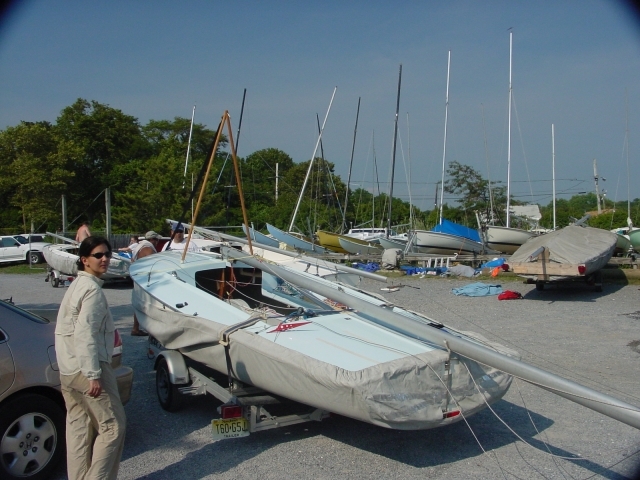 The trailer winch provides a mechanical advantage of about 10:1, so raising and lower the mast is effortless. 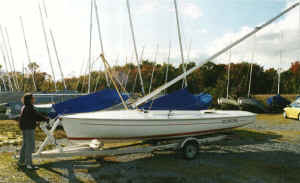 Prior to raising or lowering the mast look for over head wires, and make sure the lines and shrouds are clear from the trailer and transom of the boat. 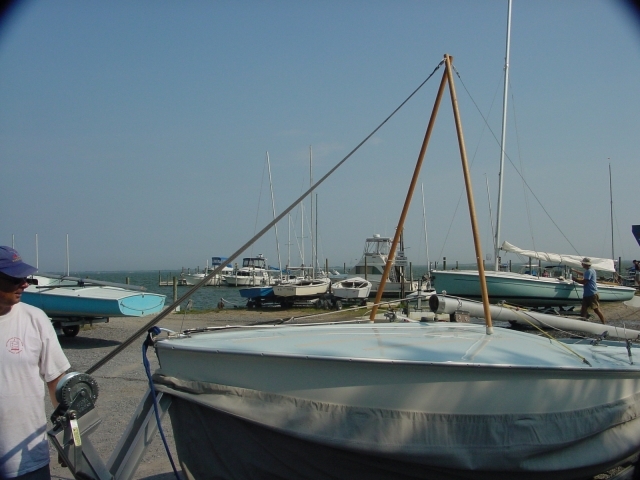 This revolutionary yet simple design provides the assistance often desired when arriving to a great sailing area with help nowhere to be found, or after a long weekend of sailing and just the though of having to lower the mast makes you wish you had your own personal 6’2", 210lb. servant. The MasterHelper is simple enough for anyone to use. The MasterHelper was developed to make the act of raising and lowering the Flying Scot mast as effortless as the Flying Scot is to sail. The MasterHelper installs in minutes with no permanently installed hardware. No drilling is required. The Kit comes with everything you need to step the Flying Scot Mast. The "A" Frame is constructed out of the finest wood available. The "A" Frame has several lines attached to it. These lines connect to the boat to help position it properly on the deck. All hardware is stainless steel for longer life. The only thing that gets installed are two nylon loops. There is no drilling to install the nylon loops. You simple remove up to six screws from the gunnel molding, place the nylon loop between the gunnel molding and boat and re-install the screws. The loops remain installed and ready for the next time you use the MasterHelper. A side to side bridle is used to keep the mast from falling to the side. 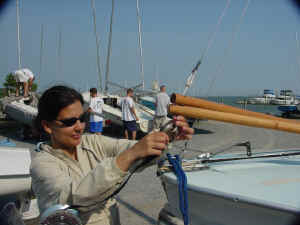 The side to side bridle is clipped to the nylon loops and is passed through the spinnaker ring on the mast. The Main Halyard is used to tension the side to side bridle. Everything attaches with hooks or shackles. The key to the MasterHelper is that it uses the trailer winch to do all the work. The trailer winch provides enough mechanical advantage that just about anybody using the MasterHelper can step the Flying Scot Mast. Make check or money order payable to Flying Scot Racing. Flying Scot ® and the FS logo are registered trademarks of Flying Scot ® , Inc.
All content in this site is copyright 2005 - No reuse of content without written permission from Flying Scot, Inc.
Last revised: April 08, 2017 .